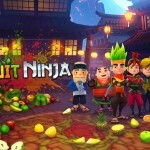 AUSTRALIA, Brisbane – June 26th, 2015 – YouTube, the world’s largest online video platform, and Halfbrick, the Australian game developer behind Fruit Ninja, will together produce a slate of original Fruit Ninja-themed content for YouTube. “The show will be targeted at six-to-10 year olds, for co-viewing with their parents. It will also be accessible from within Halfbrick’s Fruit Ninja games, which reach around 60 million users per month,” Mr White said. Celebrating its fifth anniversary this year, Fruit Ninja recently cracked the 1 billion download mark across iOS and Android devices solidifying its status as a pop culture icon. The game still reaches an average of 60 million unique players per month. Halfbrick is a professional game development studio based in Brisbane, Australia. Founded in 2001, it has developed many popular games across mobile and digital platforms including Fruit Ninja, Jetpack Joyride and Fish Out Of Water. For further information, please visit halfbrick.com and follow on Twitter, YouTube or Facebook.